Your Website is the entry point to your Online world, and serves as home-base for all your Online activities. Although a Website is an essential core component, however your company’s overall Online Presence entails much more than just a Website. A complete Website is just the starting point, and it begins with Fully-Responsive Website Design. Your Website is one of the most important aspects to the effectiveness of your overall Online Presence. Is your Website fully-Responsive, adapting to the screen size of every device on which it is viewed (desktops, tablets, & smartphones)? Is your Website database-driven, providing you with a back-end CMS to modify and control your site? Does your Website have enough content, and the right content to be listed in the Search Engines for the Keyword-phrases that your customers actually use? Do you even know what Keywords your customers are currently using to find companies like yours? 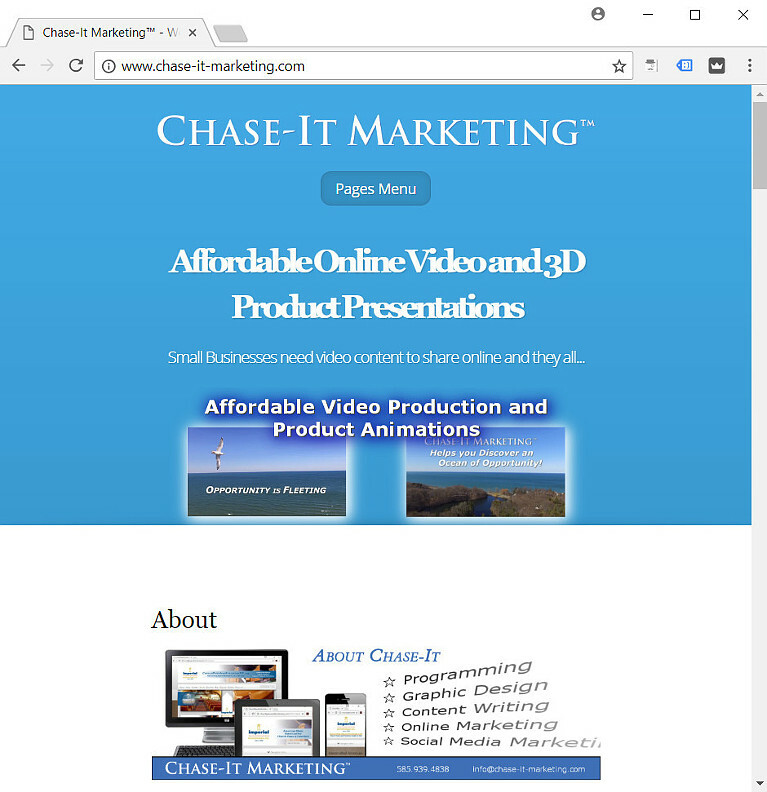 In subsequent Blog Posts, we will outline Step 2 and Step 3 in the process of leveraging your Online Presence in order to provide a continual revenue stream. Before we explain the following two steps in this process, you first need to fully understand what a complete Website should include. A fully-responsive Website adapts to the various screen sizes of the devices used to view the site, whether the device is a desktop, laptop, tablet, or smartphone. 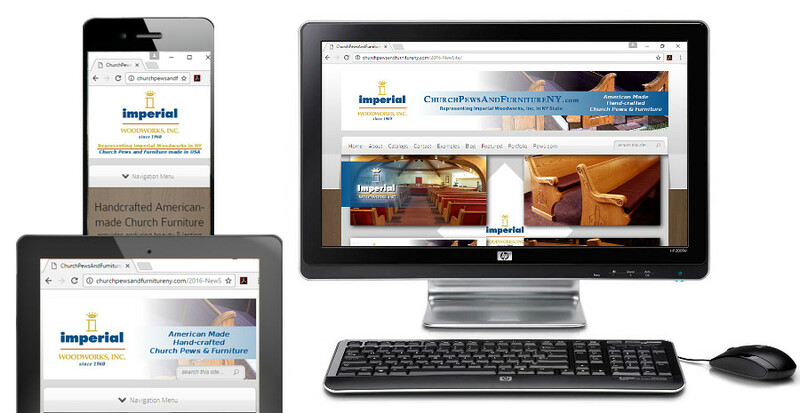 A fully-responsive Website does this in real-time, on-the-fly, on the client’s device. Back in 2012, Google began enforcing a new “Rule” that essentially forced Website Owners to make their website fully-responsive. Google’s Panda Rules provides the terms of engagement when battling other websites in the fight to be listed #1 in the Search Engine for specific Keyword Phrases. The Panda Rules dictate how SEO (Search Engine Optimization) is conducted. And among the first requirements in these Rules is for a Website to adapt its formatting to properly fit the screen of every device it is viewed upon. Why? Because it only makes sense that every webpage should appear properly to every Visitor, regardless of the device being used to view the Website. It is akin to the democratization of the Internet, by requiring Website Content to be equally accessible to each person surfing the Net. It just makes good sense that all Website Content be equally accessible to everyone, everywhere. If you want to Geek Out for a minute and learn HOW a fully-responsive Website achieves this, then click below to read more. Thus, because the programming code is downloaded and run on the Website Visitor’s device, it can query that device for information, and then react accordingly. This is how a fully-responsive Website “adapts” to the various screen sizes, as it changes its layout to fit the specific device’s screen size. Fully-Reponsive Website Design must also incorporate imagery at varying sizes for the different screen sizes. Typically, the CSS programming code uses the @media command to adjust any number of previous CSS formatting. So the code includes various screen sizes, and then adjusts the formatting or layout accordingly to visually fit the screen of the device being used by the Website Visitor. Technically, this can be seen on your Desktop or Laptop by simply resizing your Browser window, as shown below (Click the image to view full size). 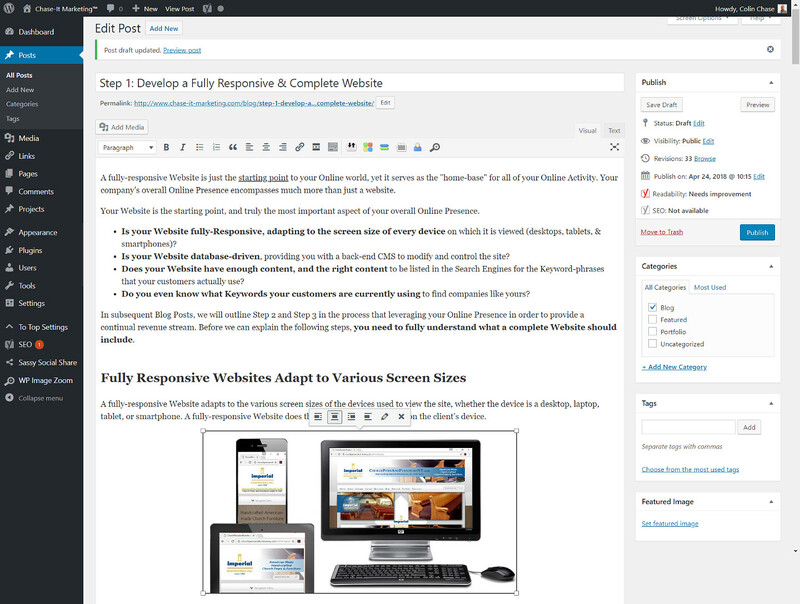 A robust CMS, such as WordPress, provides granular control of a website. This allows an Administrator to modify virtually every aspect of the Website (within parameters that are pre-set by the Theme and/or plugins being utilized). For the most part, an Administrator can “do anything” in regard to what appears on the Website, as well as how it appears. Though, ample knowledge of HTML, CSS, PHP, and CPanel are needed for advanced customizations. Additionally, popular Content Management Systems also come with a huge selection of Plugins to extend or expand the functionality of the Website. Plus, with WordPress, the CMS is Open Source and not a proprietary system that must comply with the whims of a profit-based Software Company. Being an Open Source software product means that the users of WordPress have a say (and a stake) in what happens with the software. Although Google & Bing absolutely love keyword-specific content, humans prefer to see pics and graphics. Humans are visual, whereas the logic of Google’s algorithm is more conceptual (though based upon specific data-points). It is also true that the Search Engines also want your Website to include imagery, and they will provide a boost in your ranking if you follow their Rules. To be effective per the “Rules,” SEO must include the use of Imagery and Video Content to embellish and bolster the written content. Yet, only humans will recognize good imagery, as Google simply wants you to include images (as the Internet is intended to include the written word and supporting imagery). Google LOVES SEO-formatted content, per the Panda Rules. This involves Keyword-rich content that is authoritative and unique, as well as content that includes specific HTML tags that Google requires for proper onsite SEO. In order to conduct this on-site SEO during the Website Development process, Keyword Research should be conducted prior to the design of your Website. Keyword Research is a big part of effective SEO. It’s best for Keyword Research to be conducted concurrent with your Website being developed, so that onsite SEO can be incorporated from the very beginning. It is good to remember that SEO is a fluid activity that goes from Keyword Research to on-site & off-site implementation of the Keywords, and then to website traffic analysis in order to know how well your efforts performed. After the analysis, you go back to checking the importance of your targeted Keywords with Keyword Research again, which leads to the implementation of more onsite and offsite SEO efforts. SEO is an on-going activity. Google wants to see regularly updated content, and this is usually achieved by writing Blog Posts. Maintaining and updating your blog every week or two is best. Not only will your Visitors see new and fresh content, but your Blog Posts can also be shared on Social Media to generate backlinks that bring more Website Visitors to your site. Visitors to your Website want to see a a) visually impressive and b) easy-to-use Website that has c) good-quality content regarding d) the topics they are interested in reading about. 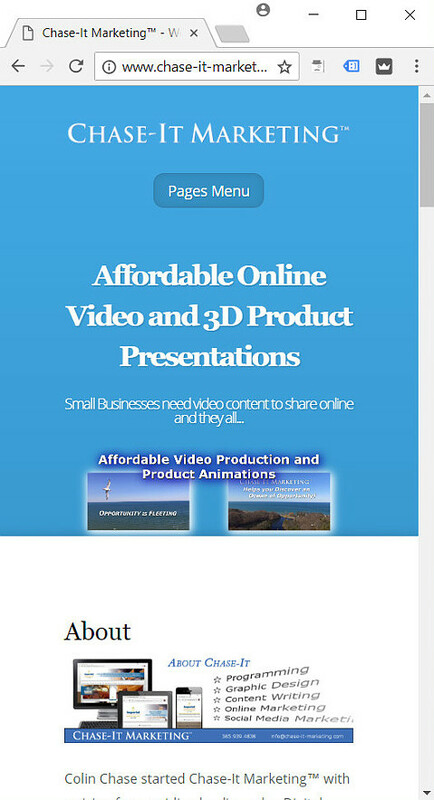 This is a tall order, as each of these 4 components (visually impressive layout and imagery, easy-to-use navigation, good quality content, and the correct focus topic) requires time and effort, as well as marketing acumen and technical skill. People searching the Web for products or services know what a good Website looks like, even if they have a hard time quantifying what this means specifically to them. Humans know “good design” when they see it. If your Website appears at all amateur, it will cause anxiety and hesitation in the visitor (whether conscious or subconscious). This anxiety typically leads them to click the back-button and return to the Search Results in Google. To garner the attention that you need to make a sale from your Website, a professional layout and design is needed. Ample imagery that enhances and embellishes the written content is best, as it conveys a consistent marketing message. Not to mention, many individuals just skim webpage content and spend far more time looking at the images in an article. The average time spent viewing a webpage is typically less than 1 minute. Imagery should be specific to the topics at hand and not generic. A Website with a lot of graphical eye-candy is much less effective when none of the images relate directly to the specific topic being discussed (or at the very least the company itself). To ensure basic Marketing continuity with consistent story-telling, a website’s imagery SHOULD directly relate to the topic at hand or at the very least relate to your company. An image is worth a thousand words, and you don’t want to waste a single one. Additionally, Google & Bing both love good imagery too. Not just for the Image Searches, but if you include an ample amount of images, it can boost your SEO ranking (so long as they include the right HTML tags and keyword density). So technically, everybody wants good images to be included on the Internet – both the Search Engines and the humans surfing the Net. The final step for a Complete Website is Google Analytics (GA). Without Analytics on your Website, you will not know how many visitors come to your website month per month. Google Analytics provides you with lots of information, which can be used to optimize your Website as well as to Report on current Website Activity and forecast Website Traffic Trends. Data Science is the study of data, typically for the purpose of forecasting or predicting. This information can be used proactively as a part of Landing Page Optimization (LPO). Google Analytics opens the door to vast Data Science possibilities. Data Science is the new Business Intelligence. Remember though, a Fully-Responsive and Complete Website is just the first (1st) step in the process of creating a profitable Online Presence. Your Website will serve as homebase for all of your Online Activity, as all future Marketing will likely lead interested people to your Website. So, your website needs to be visually impressive with ample imagery, it must also be easy-to-use with an intuitive design, and most importantly it must include good quality & relevant content. In the next 2nd & 3rd Steps to follow (stay tuned), we need to ensure that your Website is being promoted, both organically via SEO and sponsored via PPC Ads. Your website is like an Online Billboard. However, you can think of this Billboard as being on a deserted Internet highway, and so you need to lead people to your Website (so they can view your Online Billboard). A Website without Visitors does nothing, and is worth nothing. Once you have Website Visitors, then you need to cultivate the relationship with them through Social Media first (and Blogging is a Social Media activity just as Facebook and Twitter). After a Website Visitor becomes a customer, then you manage the relationship through Online Reputation Management as well. Communication is the key, and a Website is the preeminent Communications Medium of the modern era. 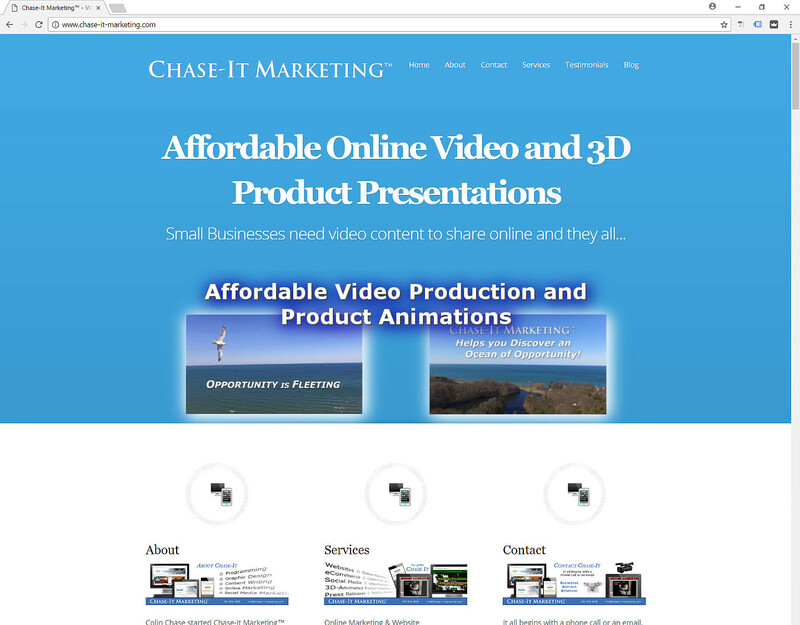 Call or Email Today – Discover what Chase-It Marketing can do for you! Please check out our more recent Fully-Responsive Web Design Projects. Fully-Responsive Website Design, WordPress Website Development, eCommerce Development (Online Stores), Online Marketing (SEO & SEM / PPC Ads), Social Media Marketing, Content Development (Copywriting), Publicity Generation, Press Release Development & Online Distribution, Graphic Design, and more. Frickin’ remarkable things here. I am very glad to see your post. Thanks for the insights. I’m taking a look ahead and plan to contact you. Will you kindly drop me an email response? Thank you for visiting our site and making comments, we appreciate the dialog and the input! Sorry it also has taken me some time to respond. I will send you an email shortly. Please always feel free to reach out to me again. I really like your writing style, fantastic information, thanks for putting it up. 😀 “Every moment of one’s existence one is growing into more or retreating into less.” by Norman Mailer. Thank you for visiting our site and making comments, we appreciate the dialog and the input! A responsive-website is crucial for delivering content properly based upon the visitor’s device, as well as crucial for SEO Ranking. Welcome to our New “Animated” Website for 2019!